Who would have guessed that a plastic flamingo would have such staying power? This is the tale of a wonderful bird: named by his creator, Don Featherstone, as phoenicoptertis rubber plasticus; a new avian species, now known to all as “Pink Plastic Flamingo.” It hit the market in 1958, and to Featherstone’s recollection, sold in pairs for under $3. “There was an automobile dealer from Oklahoma who bought 700 flamingos from me and paid to have them express-mailed to him. He had been using them to get publicity. He and his employees would sneak out in the night and put them up as a flock in some conspicuous place, and it would make the news. Each morning the flamingos would mysteriously appear in a new location – no explanation, no signs or anything. It got to where they had morning traffic reporters in their helicopters reporting on the latest location of the flock. The car dealer’s plan was that, on the last day of his stunt, the flock would show up at his dealership. What he didn’t count on was that people would stop on the highways and steal them. 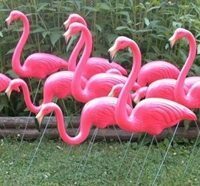 Pink Flamingo Day was declared in 2007 by Dean Mazzaralla, the mayor of Leominster, MA to honour the work of Don Featherstone, creator of the plastic lawn flamingo. Show your love for pink flamingos on Pink Flamingo Day! It is June 23. Be sure to mark your calendars well in advance so you don’t miss it!